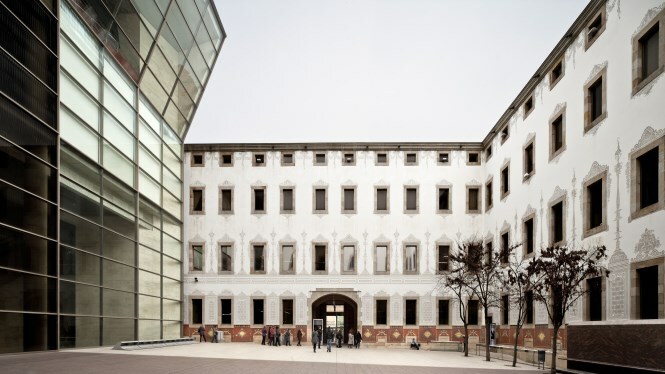 Housed in the former almshouse, the Casa de la Caritat, the CCCB is a space for creation and research as well as the dissemination of, and debate on contemporary culture, where the visual arts, literature, philosophy, film, music, transmedia activity and the performing arts are interconnected in an interdisciplinary programme. The CCCB centres its activities on creative research and the production of knowledge through a series of core projects produced in-house, such as thematic exhibitions and other live events and digital formats: international debates, the CCCB Lab, the literature platform Kosmopolis, the Beta line of activities, the Xcèntric experimental film festival and other events. Opening time: Tuesday to Sunday, from 11am to 8pm. | January 5th and 6th, December 26th: from 11am to 3pm. | Closed: January 1st and December 24th, 25th and 31st. The Centre de Cultura Contemporània de Barcelona (CCCB) has no architectural barriers and runs guided tours adapted to the needs of different types of visitors. Admission is free for senior citizens and holders of the Targeta Rosa (a transport card for the over 60s and people with disability levels of 33% or more, which provides free admission and discounts at museums and attractions. To obtain the card you must be on the Barcelona electoral register). The CCCB can arrange descriptive guided tours for blind people. Prior arrangement is necessary. Many of the feature films and short films screened at the CCCB are in their original language with Catalan subtitles. These subtitles are helpful to deaf people, although they haven’t been specifically designed for them. The members of staff leading the guided tours use voice amplifiers. The entrances to the CCCB are at street level and, once inside, visitors with reduced mobility can get around the building using the lifts that connect the different floors and the different ramps which, in some cases, are longer than the distance stipulated in the accessibility guidelines. The interiors of the galleries are very spacious and wheelchair users can move around comfortably. The CCCB takes standard mobility requirements into account when designing its exhibition layouts, ensuring visitors can move freely around the space. The building has adapted toilets. The Pati Manning, the courtyard which is the former cloister of the Casa de la Caritat (the former workhouse which was converted into the CCCB), hosts cultural events. There is flat-floor access to the courtyard and cafeteria and they also have adapted toilets. You have to ask for a key to use them as they are normally closed. Since 2010, the CCCB runs the program AlzheimArt, which offers guided tours in exhibitions for Alzheimer's patients, their families and caregivers. Write the result of the calculation "0 + 4"